I was away from my computer at the release of the ISM Non-Manufacturing Index number, which happened to come out better than expected at 58.9. 58.9!!! Great for Dollar bulls, but unfortunately not so good for my pick of the day. So, I wasn’t able to close the trade out right after the release and it looks like we took the full loss when the pair stopped out. US Dollar traders have been focusing on weak US data for the last few months, and since ISM Non-Manufacturing Index is the only significant US report we will see until the jobs data on Friday, I think this will be the only data we will see some volatility and possibly a trade opportunity. The ISM Non-Manufacturing Index is going to be released at 10:00 am EST with a forecast number of 55.0 versus the previous number of 57.1. So, analysts think the service sector is already going to slow, but what if we an even worse number like with did with the manufacturing number this past week? This means bad news for the US economy and bad news for the Dollar. On the chart, I drew an area of strong support – the two lines and some pivot points. The dark purple is a previous from May 2005, and the pink like is the previous low on December 01, 2006. You can also see the S1 pivot line right in between that area. 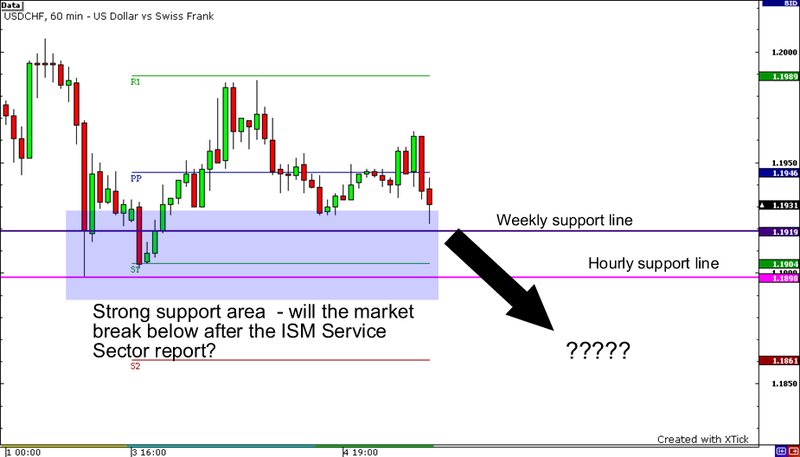 If market prices break through this area we may see the pair reach the S2 and S3 lines. So, we are shorting one lot and moving stop to breakeven when pt1 is hit. If pt2 is hit close the trade. Based on market reaction and movement, I may update in case we need to adjust our position. Good luck and good trading!